"Our family's traditional Christmas recipe, frequently doubled and kept warm in a crock pot. Worth the effort, and the meatballs are even better the next day! Reserve brown gravy and add sour cream to it the day you serve the leftovers." Place the bread crumbs into a small bowl, and mix in the cream. Allow to stand until crumbs absorb the cream, about 10 minutes. While the bread is soaking, melt 1 teaspoon of butter in a skillet over medium heat, and cook and stir the onion until it turns light brown, about 10 minutes. Place onion into a mixing bowl; mix with the ground beef, ground pork, egg, brown sugar, salt, black pepper, nutmeg, allspice, and ginger. Lightly mix in the bread crumbs and cream. Melt 1 tablespoon of butter in a large skillet over medium heat. Pinch off about 1 1/2 tablespoon of the meat mixture per meatball, and form into balls. Place the meatballs into the skillet, and cook just until the outsides are brown, about 5 minutes, turning the meatballs often. Insides of the meatballs will still be pink. Place browned meatballs into a baking dish, pour in chicken broth, and cover with foil. Bake in the preheated oven until the meatballs are tender, about 40 minutes. 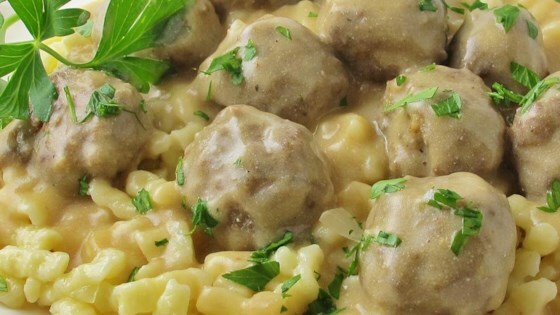 Remove meatballs to a serving dish. To make brown gravy, pour pan drippings into a saucepan over medium heat. Whisk the flour into the pan drippings until smooth, and gradually whisk in enough beef broth to total about 2 1/2 cups of liquid. Bring the gravy to a simmer, whisking constantly until thick, about 5 minutes. Just before serving, whisk in the sour cream. Season to taste with salt and black pepper. Serve the gravy with the meatballs.